Read the whole review below or jump to any section using the main headings below and the sidebar on the left. 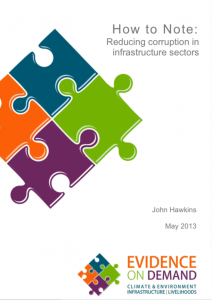 Or you can download a complete copy of this sector review as a pdf document to read separately..
Level 1. Construction, Public Works and infrastructure is a complicated subject in government. It can be the responsibility of a Ministry in its own right, such as the Ministry of Public Works or Urban Development, or a Ministry dealing with Public-Private partnerships. It can be a major part of other ministries, such as within the Ministries of Transport or Energy. Alternatively, large projects might be separated out from government as Public-Private Partnerships or placed under the supervision of a national Major Projects Agency. There are many corruption issues arising at this ‘Ministry-level’. Level 2. At the same time, individual projects can be enormous, sometimes larger than a whole country’s GDP, with immense complexities. There is thus another block of corruption issues at this ‘Project level’. Terminology note: For brevity we often refer to this sector review as ‘Construction’ rather than the full title of ‘Construction, Public Works and Infrastructure’. The originating author of this section is Mark Pyman, who is the managing editor of CurbingCorruption. Additional contributions have been made by Neill Stansbury; Peter Matthews; Hamish Goldie-Scott; John Bray. At the policy-making and regulation level, there is great scope for constraining the corruption that can arise from uncontrolled projects and developments. The scope is greater early on rather than during later phases, such as at the tendering, construction or payment stages. Similarly, a 2016 analysis by the Hertie School of Governance in Germany concludes that the way in which infrastructure policy is governed has more impact in reducing corruption than ‘traditional’ measures such as tight regulation. They identify four key reasons for poor infrastructure performance – Analytical capacity, Delivery, Regulation and Coordination. They point most of all to insufficient coordination across government as the major reason for both poor efficiency and corruption. At the high level of decision making that is associated with policy on major public works and infrastructure projects, the corruption type itself is rather simple – it is collusion, favouritism and illicit influence in the decision making. The variation is not so much in the corruption type as in the different ways that the opportunity for corruption arise and are constrained and controlled, or not. Corrupt influence exists especially due to capture of the decision-making process by elites, to poor coordination across the many bodies involved, to the endless complexity of construction projects, and to biased intermediate-level decision making. Conducting special analyses of possible illicit influence. At the same time, there is also a need for policy level responses to the lower level corruption, such as in permits and licenses, as these too can enable the growth of collusion and illicit influence. Many governments are moving to adopt ‘Open Government’ standards in respect of public procurement, and particularly in respect of construction. One major aspect of this is ‘Open Contracting’ where the government commits to much greater transparency in respect of all aspects of public infrastructure contracting. These organisations are discussed in Section 4 Transnational initiatives. Improved public procurement, including for construction, has seen huge advances in anti-corruption and transparency in the last ten years, from electronic procurement in multiple countries (See here for one of many such initiatives in Korea) across to radical reform in conflict countries (See here for Afghanistan’s National Procurement Authority example, which includes re-review of numerous construction tenders). The Open Contracting Partnership also has numerous examples. In some countries, a significant part of the construction and public works corruption problems lie with Ministry officials, both low level ones and at the most senior levels. Ministries can easily become corrupted in whole or in part, or, at the least, tolerant of dubious behaviour. In countries with high and endemic levels of corruption, this problem may reach the point where the Ministry is ‘captured’ by corrupt interests. If the problem is deep rooted, changing the mandate and structure of the Ministry and its related agencies might be necessary. Two current examples are from Afghanistan, a country that is recognised as deeply corrupt, but at the same time is making huge efforts against corruption. Afghanistan has had chronic corruption problems with its public procurement system. Through this system passed all the major public works and construction contracts, and this was well recognised as the epicentre of large-scale elite corruption. After a brief review of alternatives in 2016, the Afghan government decided on a radical reform based on a single regulatory body and a centralized procurement system. At the apex of this system is the National Procurement Commission (NPC). The NPC is chaired by the President of Afghanistan, with membership of the Chief Executive Officer, the Second Vice President, and the Ministers of Finance, Justice and Economy, together with the President’s Senior Advisor on Infrastructure Affairs. Also in attendance as observers are civil society, SIGAR (the US watchdog on US spending in Afghanistan), and NATO’s Resolute Support Mission. Under the NPC is the National Procurement Authority (NPA), located within the Administrative Office of the President. The NPA is the “engine” of the procurement system; its team (currently around 280 staffers) links with the Procurement Departments in every Ministry, which are responsible for the administering the tender process. The NPA and the Ministry procurement teams go through a back-and-forth process (with strictly controlled time allowances for each iteration) in order to get each tender to the point where the NPA agrees that the contract can be put up to NPC for approval. The NPC’s members (including the President himself) then personally review each contract and collectively decide whether to approve or reject them at a weekly meeting (which usually lasts for 2-3 hours); the NPC approves typically about 10 contracts per meeting. All the decisions of the NPC are made public. The NPC has reviewed some 3,000 contracts, worth nearly $6 billion, and approved most but not all of them. 88% of the contracts have been won through open tendering, 10% through restricted bidding, and 2% through single source. 145 fraudulent companies have been debarred. This structure is remarkable for several reasons. Running a disciplined tender approval process is very hard work, even in sophisticated modern corporations. Keeping to a tight timetable requires immense discipline. It is remarkable that Afghanistan’s whole government procurement machine—above the threshold level—is running through this system, particularly given the enormous commitment of time by the senior leadership. These leaders are also facing significant pushback from those whose interests are threatened by the creation of such a large “Island of Integrity”; indeed, accusations of corruption being flung back at the NPC and NPA in an attempt to undermine them. Moreover, a very different work culture is needed to run such a system. This is most noticeable in the NPA, which has harnessed the aspirations of young generation to work with increased efficiency and transparency to make a difference. Confidence is built from knowing that it is possible for the senior decision-making process and results to be scrutinised by others. One such example was given above, where the President plus relevant Ministers, plus outside stakeholders all participate in real time in the decision-making on each of the large procurements. They all have opportunities to ask questions. Integrity approaches are a known part of the ways to constrain corruption – by improving the behaviour of staff rather than by compliance. In most national anti-corruption strategies, efforts to build integrity across the public sector are part of the mix of measures. 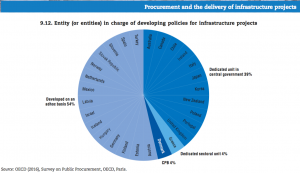 In respect of public works and infrastructure, OECD have been putting effort into elaborating this approach. 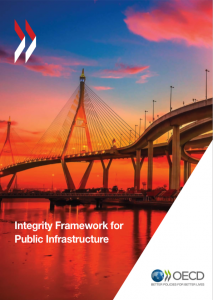 The OECD 2016 report Integrity framework for public infrastructure is a contribution to developing policy and regulatory guidance for controlling integrity and corruption in construction. The table opposite is taken from that report. It shows policy responses both to promote integrity and to constrain corruption opportunities. ‘Infrastructure projects constitute a major mandate of governments in the delivery of key public services and have high and direct implications on a country’s economic capacity, human development, social inclusion and environmental sustainability. once a project is planned and financing schemes have been defined, it is critical that governments deliver infrastructure projects in a cost- efficient way that is trusted by users and citizens to fulfil their mandate. Example: Australia. The 2016 analysis by the Hertie School of Governance in Germany quotes the positive experience of Australia, who set up ‘Infrastructure Australia’ as a cross government agency to better coordinate government infrastructure planning (p46). The World Economic Forum has many good observations about how nations can strengthen themselves by way of policy measures in the infrastructure sector. 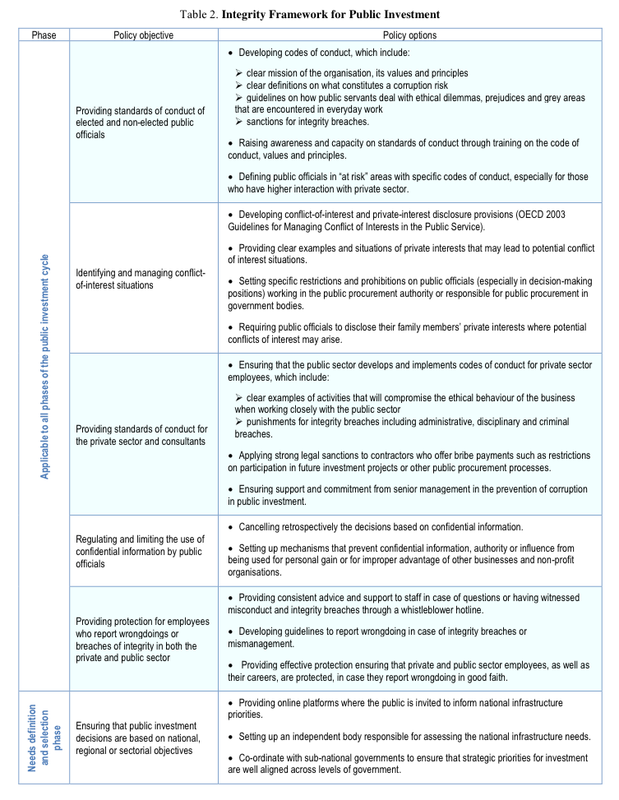 Below, in an example from Mexico, is a policy-maker’s approach to different ways of controlling corruption in permits and licenses (WEF, 2017). Solutions for corruption in permits and licenses. There is much to be learnt from talking to the executives of the large construction and infrastructure companies. The Price Waterhouse Coopers 2014 report finds that 70% of all corruption related to their projects is caused by insiders within their companies; most of them senior management. In cases where companies have been exposed in large corruption scandals, one of the industry responses, in mitigation, is to establish an advisory council of worthy people to advise the company on how to behave better in future. Two recent examples are from Airbus in Europe and Odebrecht in Brazil. There is no known evidence, however, on whether such councils are effective or perform merely as a whitewash. An International Infrastructure Support System (IISS) that is being developed by the Sustainable Infrastructure Foundation in association with a number of multilateral development banks. The IISS is an online project preparation platform that provides resources to improve project preparation and encourage collaboration between investors and government. It will be accessible to investors and the public and is intended to provide a high-quality, consistent and systematic approach to early-stage project development. The immense complexity of major construction projects prompted many authorities to look at additional oversight of the specific projects by civil society bodies as an additional check on corruption risk. Examples include the new Berlin airport in 2005 (See Olaya 2010, pages 120-125) and hydroelectric power plants in Mexico (See Olaya 2010, pp 110-119). One of the biggest funders of infrastructure projects in the developing countries are the Development Agencies. They have long had an interest in how to develop such projects to minimise corruption: one such example, How to reduce corruption in infrastructure sectors, written for the UK Development Agency DFID (Hawkins, 2013). Other Aid agencies also have extensive knowledge of corruption issues in public works and construction, such as USAID. There is also a lot of knowledge on how and why construction projects went wrong. The diagram below, for example, shows an analysis of time and cost overruns for seven developing countries plus the UK. 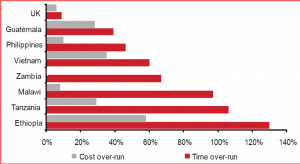 This shows the average time and cost overruns on a sample of 145 public sector construction projects in eight countries (Construction Sector Transparency Briefing Note 5 from CoST). There are other approaches that you can take to shape the construction and public works environment. The actual reform measure in each case will be specific to your local context. You can read about different reform approaches that you can take and see how/whether they apply in your environment in other sector reviews. Individual construction projects can be enormous, having budgets the same magnitude as a nation’s total annual spending, involving many thousands of sub-contractors. Each one, singly, therefore warrants dedicated attention to the corruption risks. One such example was the new airport in Berlin, Germany, which was cancelled due to corruption concerns and, when restarted in 2005, accompanied by an ‘Integrity Pact as an additional way to limit the corruption risk. The Head of the Global Infrastructure Anti-Corruption Centre identifies 13 features that make construction projects particularly prone to corruption. Besides the large size of the projects, he notes Uniqueness – No two construction projects are the same making comparisons difficult and providing opportunities to inflate costs and conceal bribes; Complex transaction chains – The delivery of infrastructure involves many professional disciplines and tradespeople and numerous contractual relationships that make control measures difficult to implement; the fact that work is concealed – Materials and workmanship are often hidden, e.g. steel reinforcing is cast in concrete, masonry is covered with plaster and cables and pipes enclosed in service ducts; and official bureaucracy – numerous approvals are required from government in the form of licenses and permits at various stages of the delivery cycle, each one providing an opportunity for bribery. At the early stage of a project – the concept and appraisal phase – the corruption opportunities are for politicians, senior officials or major companies to acquire public resources via political influence, collusion or similar. Such large-scale corruption takes place during the early stages of the project cycle, particularly during project identification, project preparation and procurement, where the financial rewards for a one-off act of corruption are potentially highest. Examples of these forms of corruption include selection of high value uneconomical projects (to allow for kickbacks and political patronage, designs that favour particular firms, and kickbacks for contract award. At the project design, tender and construction phases, more operational forms of corruption are the norm, where payments are extracted by public officials from the users of a service or offered by a company to speed up or overcome an administrative or legal procedure during the later stages of the project cycle. Fees are paid to secure routine services such as provision of electricity or access to clean water. For a company, such corruption can include a fee to get an invoice paid, to certify completion of the works or obtaining customs clearance for equipment and materials. From U4. Construction risks at various stages in the delivery of a construction project. Example: Canada and collusion in the construction industry. Collusion among clients, consultants, and contractors is in fact believed to be widespread in the construction industry in many parts of the world, including in highly developed countries. Evidence is difficult to obtain, but the work of the Charbonneau Commission in Quebec (2017) is throwing a bright light on the corrupt relationships among the actors in public construction. The Commission’s findings … revealed complex webs of collusion, as well as highly sophisticated stratagems for the extraction of funds from public construction projects. Politicians, high level public officials, consultants, and contractors are all involved.’ (Wells (2015) Corruption in the construction of public infrastructure). Example: UK and collusion in the construction industry. The UK has been relatively open about corruption in its construction industry, as already mentioned, and the review by the Construction Industry Board (2013) is worth reading. Harvey (2014) comments that ‘Corruption in the construction industry is deep-rooted and the UK’s example at confronting the problem is admirable.’ For example, an investigation by the UK Office of Fair Trading in 2008 uncovered widespread collusion amongst companies bidding for government contracts (Matthews 2016). 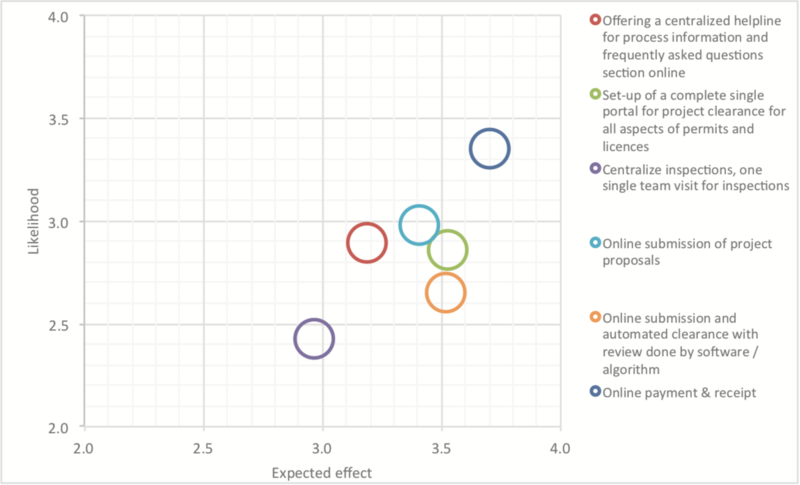 Such findings have led to a move away from competitive tendering based on lowest price and towards a greater focus on quality and collaborative working arrangements. Another typology comes from Stansbury at the Global Infrastructure Anti-Corruption centre (GIACC). Ernst & Young (2014) Managing bribery and construction risks. The real estate, construction and infrastructure industry. 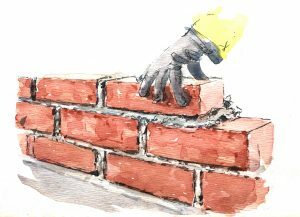 How you develop your strategy for tackling corruption in construction projects depends on which of the two different situations that we described earlier you are in: Working at ministry level or working on a construction project. For example, your strategic objective in a public works ministry could be to raise the trust of the public in the construction of public infrastructure, or to ensure that all construction professionals and officials operate to high ethical standards, or to reduce the average cost of all Ministry-sponsored construction. However, at ministry-level, there is no published overall strategy that we are aware of (although we understand that Afghanistan Ministry of Public Works has recently set out one, as at mid 2018). At project-level, your strategy objective might be to eliminate bribery in all the aspects of project design and construction, or to stop price inflation due to collusion among construction companies and the sub-contractors, or to enable all professionals involved in the project to safely report corruption by, without fear for their job or family. Most of the sources quoted in the previous section (here) also give guidance at the more strategic level. GIACC is a UK-based centre run by two construction lawyers, Neill Stansbury and Catherine Stansbury. They have a huge database of supportive material and templates that you can pick up and use. Since its launch in 2008, the GIACC Resource Centre has been visited on-line by organisations and individuals from 190 countries. You can contact them here. PS 1: Independent assessment: An independent assessor should be appointed whose duty is, for the duration of the project, to monitor and assess the project for corruption and report. PS 5: Project anti-corruption commitments: The project owner and each major project participant should provide anti-corruption contractual commitments which expressly cover the main types of corruption, and which oblige them to implement anti-corruption measures. PS 6: Funder anti-corruption commitments: The project owner and each project funder should provide anti-corruption contractual commitments to each other which expressly cover the main types of corruption, and which oblige them to implement anti-corruption measures. PS 7: Government anti-corruption commitments: Relevant government departments should take steps to minimise extortion by their officers in the issuing of permits, licences and approvals. They should appoint a senior officer to whom complaints of bribery and extortion can be made. PS 8: Raising awareness: Major project participants should raise awareness among their staff by posting up anti-corruption rules at all project and site offices and providing anti-corruption training. PS 9: Compliance: Major project participants should appoint a compliance manager who will ensure compliance by the company and its management and staff with their anti-corruption commitments. PS 12: Enforcement: Enforcement measures for breach of anti-corruption commitments should include civil enforcement (e.g. disqualification from tender, termination of contracts, damages and dismissal). The risk of criminal enforcement (e.g. imprisonment) should be highlighted. Project Anti-Corruption System (PACS): A set of measures designed to help prevent corruption on major projects. See the box below. Anti-corruption training: On-line anti-corruption training module (available in English, Spanish, French, German, Italian, Polish and Romanian). Anti-corruption training manual (available in English, Spanish and Chinese). Informationon anti-corruption conventions, forums, indices and surveys, and initiatives. CoST is a multi-stakeholder sector-specific initiative, currently with 15 participating nations. Launched in 2012, ‘CoST grew out of the lessons learnt from a three-year pilot programme which tested the viability of a new transparency and accountability process in eight countries. CoST promotes transparency by disclosing data from public infrastructure investment.’ You can contact them here. Disclosure of information (from relevant state procurement agencies, e.g. road, health). This consists of 40 data points of information over the lifecycle of the programme. It starts on a voluntary basis for nations, then sets up formal disclosure requirement. Guatemala has recently done this. Each CoST project works via ‘Multi-stakeholder working’ comprising representatives of government, the private sector and civil society. Assurance is the 3rd CoST can organise independent assurance of one or more national projects. CoST prefers that government do this role, e.g. through audit, but in general public trust is low, so this is not useful. CoST may therefore select a small sample of projects to monitor. 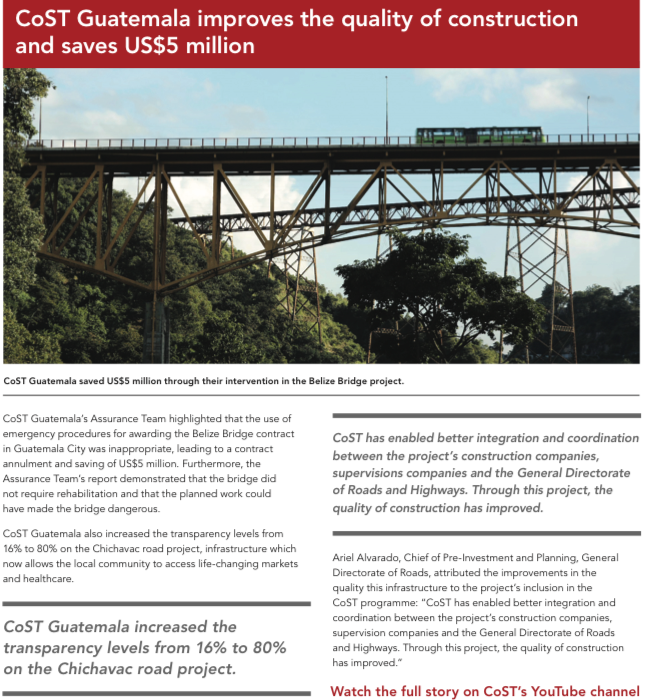 For example, there are some 5000 projects within the CoST project in Guatemala). CoST achieves its impact by strengthening Social accountability. This often means working with existing institutions. For example, in Honduras there are hundreds of citizen monitoring groups at municipal level and CoST has been training them. There is also a process under way to fully integrate – for Infrastructure Projects and Contracts – the CoST Infrastructure Disclosure Standard and the Open Contracting Data Standard for Infrastructure Projects (See Section 4.3 below). If you are not a participating nation, you can already use some of their guidance and benefit from seeing some of their successes, as described on the CoST website. As a participating nation, they offer the valuable opportunity to bring additional anti-corruption expertise into your country and specific issues, and to lend extra weight to problems that may otherwise more easily defeat you. For example, Ukraine is a participating nation and there the CoST team are taking the lead in encouraging the disclosure of more information relating to road construction. Such disclosure in the early years is subject to the whims of just a few individuals, and the involvement of an international group such as CoST can make more difference than local pressure only. They can access Ministers and the Cabinet of Ministers, if necessary, where there is resistance. They can also publicise obvious conflicts of interest, such as when quality control is not exercised by an independent agency, or when the road companies use Parliamentary connections to gain contracts. In Honduras, they are developing such civil society monitoring capabilities by training and capacity building. Bringing about change in a sector where the status quo has long favoured corrupt officials and contractors will still be very hard; but it will be easier together with an international entity like CoST than doing it alone. This is the big lesson of these international sector-specific groups. The Open Contracting Partnership started in 2012, and in 2015 was spun out of the World Bank to become an independent programme. OCP has a well-practised methodology for how a Ministry, or a nation, can implement a policy of cleaner contracting. The technical basis for the guidance is a standard for open data, so that all parties can see the key data related to any contract. Country evidence so far includes Ukraine, Nigeria, Latin America and the UK. A secretariat is based in Washington, D.C. OCP are governed by an independent Advisory Board, made up of individuals from government, the private sector, civil society, the technology sector and development. There is also a ‘subset’ of OCP, the ‘Contracting 5’ initiative. Colombia, France, Mexico, United Kingdom, and Ukraine officially launched the Contracting 5 (C5) initiative during the OGP Paris Summit in 2017. OGP is broader than either construction or contracting: it is a multi-nation platform dedicated to enhancing cooperation between governments and civil society. OGP was launched in 2011 to provide an international platform for domestic reformers committed to making their governments more open, accountable, and responsive to citizens. Since then, OGP has grown from 8 countries to over 70 participating countries and 15 subnational governments. In all of these countries, government and civil society are working together to develop and implement ambitious open government reforms. If your country is a member of OGP, then you should be able to harness resources from OGP, and to ensure that public works reform is contained within the ‘National Action Plan’ that your government will be implementing in respect of getting more benefits from civil society engagement. In general, OGP’s engagement on infrastructure transparency tends to run through COST and OCP, with which OGP has cooperation agreements. Read OGP’s website here. UNDP is well aware of the importance of tackling corruption in construction. See this, for example after the ‘Agenda 2030’ was adopted in New York at the end of 2015: ‘Given the magnitude of potential losses to corruption in the infrastructure sector, mounting to trillions of dollars annually on a global scale, clean construction is also of paramount importance for achieving Goal 16 on building peaceful, just and inclusive societies. …We will fail on both these aspirations if we remain unable to substantively reduce all forms of corruption…Increased transparency and accountability in the construction sector is thus a sine qua non for a successful outcome of the 2030 development agenda’. Example: Mongolia and UNDP engagement on construction corruption. Construction companies face corruption risks throughout all steps of construction from submission of building permit requests until the State Committee endorses that building meets all technical requirements and standards. Corruption costs affect both small and large construction companies alike, and as a result increases the price paid by consumers. So, what are specific corruption risks at each of these stages and how can we address them? This was the main theme of the discussion held at the Chamber of Commerce and Industry of Mongolia on 23 November 2015 among construction companies, professional associations, and relevant government agencies. See Mongolia. U4 has a 2015 guide on how to oversee and/or monitor corruption risks in large infrastructure projects, ‘Corruption in the construction of public infrastructure. 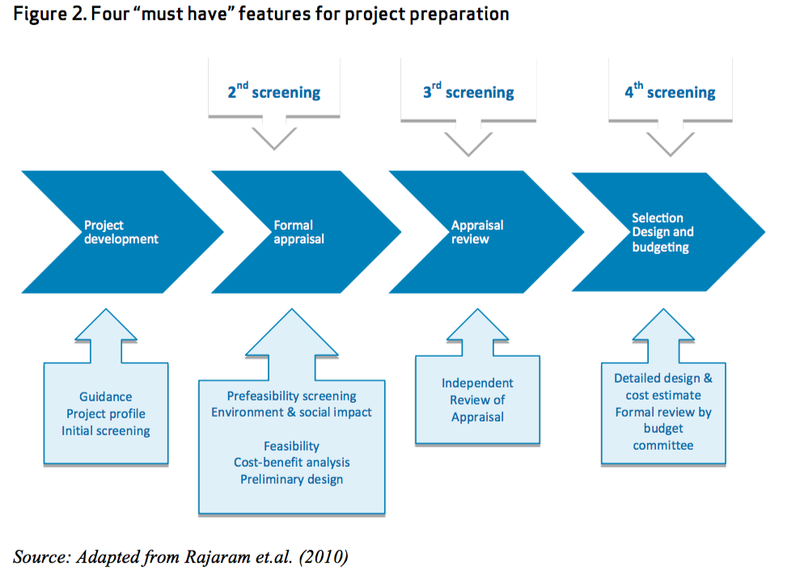 Critical issues in project preparation’. The diagram below, for example, shows their representation of how a government can obtain assurance about integrity at the project preparation phase. Matthews, Petter (2016) This is why construction is so corrupt. World Economic Forum. 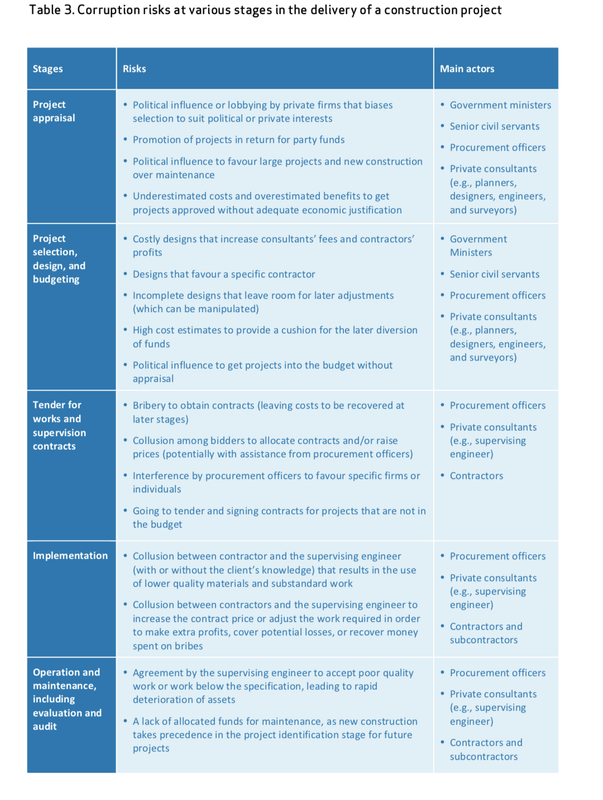 OECD (2016) Integrity framework for public infrastructure. Price Waterhouse Coopers (2014) Fighting corruption and bribery in the construction industry.